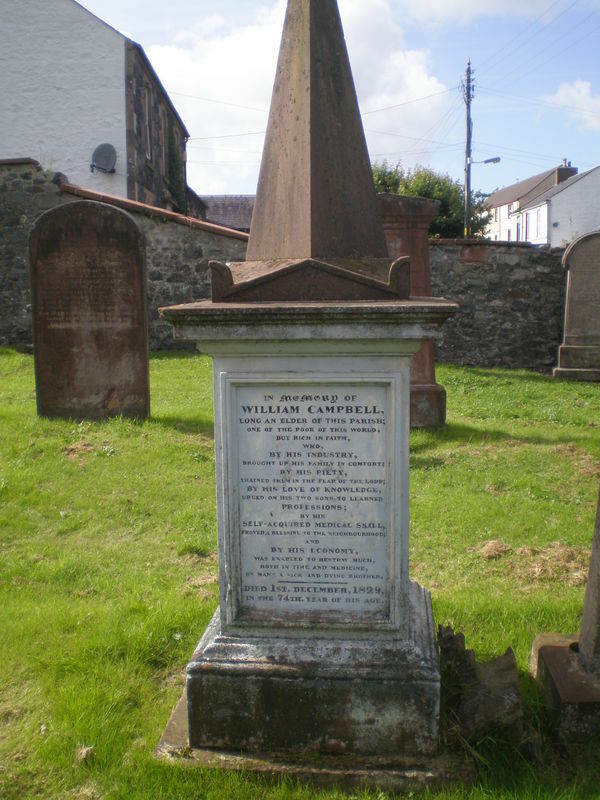 Front (A short column with spire) In memory of William CAMPBELL, long an elder of this Parish, one of the poor of this world, but rich in faith, who, by his industry brought up his family in comfort; by his piety trained them in the fear of the Lord, by his love of knowledge, urged on his two sons to learned professions; by his self acquired medical skill, proved a blessing to his neighbourhood and by his economy, was enabled to bestow much, both in time and medicine on many a sick and dying brother. Died 1st Dec. 1829 in the 74th year of his age. (Left) Agnes BIGGS, wife of the late William CAMPBELL, died 7th August 1838 in her 78th year. Jacobina their second child died in infancy. Jean their fifth child died 30th Sept. 1837 in her 36th year and was buried at Traquair. (Right) Sarah CAMPBELL died 31st…….. 1857 aged 72 years. GC, “Kirkyard gravestone 8,” Carsphairn Archive, accessed April 24, 2019, http://carsphairn.org/CarsphairnArchive/items/show/114.